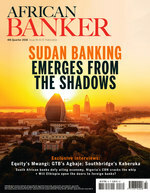 African Banker - our quarterly magazine - is the most important player in the banking and finance sectors in Africa,. It covers news from the banking, finance, insurance, currency, direct and indirect financial investment sectors, as well as the stock markets and capital markets, tapping into the growing demand for information about Africa’s banking and financial world, a sector that is consolidating rapidly and reshaping the economy of the continent. Established over 50 years ago, IC Publications has extensive experience in publishing magazines, newsletters, country supplements, industry reports and market intelligence on Africa. With a vastly knowledgeable and well connected editorial team, you are guaranteed one of the most insightful commentary and analysis from this dynamic and extraordinary region. In addition, their specialist contributors from around Africa ensure the special monthly reports are the definitive analysis of the latest business and economic developments. Their award winning Pan-African publications include New African, African Business, African Banker, New African Woman, Le Magazine de l'Afrique and Femme Africaine and is ideal if you are looking for up-to-date expert information on issues affecting Africa today.